These scores are indeed truly remarkable, and completely confirm the apparent pattern of Lynn’s IQ samples, in which desperately poor East Asians tend to score at or above the levels of the most successful and well-educated Western populations… But since the total population is at least well into the hundreds of millions, heavily rural as well as urban, the average PISA score of 520—corresponding to an IQ of 103—cannot be too dissimilar from the overall Chinese figure. 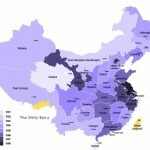 And with China’s per capita GDP still only $3,700 and well over half the population still living in rural villages when the tests were conducted, these are absolutely astonishing results… Although opinions may certainly differ, I regard this new evidence as very strong support for my “East Asian Exception” hypothesis. China isn’t anywhere near as backward as he portrays it. (1) The urban-rural ratio was essentially 50/50 according to the 2010 Census. Furthermore, rural Chinese don’t really suffer from the absolute destitution common to peasants in Third World countries. They own their own land and it is almost impossible for them to lose it. Malnutrition is now close to non-existent. Slums are now very rare. According to a Gallup poll, Chinese now actually struggle less than Americans to buy food. (2) Total Chinese meat consumption overtook US meat consumption in 1990, signifying a nutritionally adequate figure (as Americans eat a lot of and perhaps a bit too much meat anyway). Today Chinese meat consumption is half the US level. The PISA 2009 cohort would have been born in 1993, when Chinese nutrition had already essentially converged with the First World. (3) He uses nominal GDP per capita which is quite meaningless. 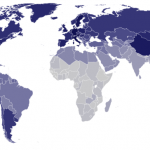 The PPP level of Chinese GDP per capita is $8,400 and that figure is probably underestimated. Basically, if we adjust for the fact that in terms of basics (food, education, housing) China is now essentially equivalent to developed countries, it would make sense that its average IQ level is now only about 5 points from its potential maximum. But really my fundamental problem with the “East Asia Exception” hypothesis is the huge paradox it exposes: Why was it Europe, and not China, that first underwent the Industrial Revolution? And the (initially unrelated) Scientific Revolution, for that matter? If as Ron Unz says the Flynn Effect barely applies to East Asian populations, then what you’d have had five centuries ago is 100mn Chinese, 20% of them urban – with an average IQ of maybe 95; and 100mn Europeans, only 5% of them urban – with an average IQ of 75. Sure Europe had various advantages (as chronicled by Jared Diamond, Kenneth Pomeranz, etc) but surely it couldn’t have trumped the effects of a 1 S.D. IQ advantage? That is why I believe the East Asia Exception to be historically implausible.